Leaf-shaped Neolithic flint knife or oval side scraper dating from c. 3000-2100BC. 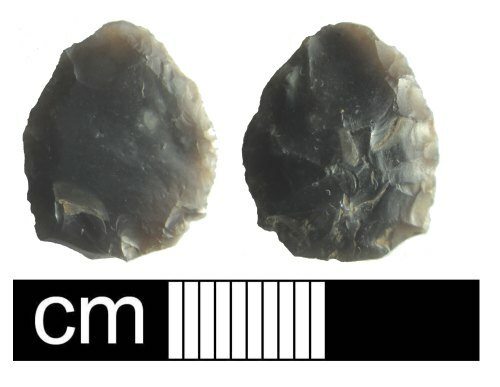 This object appears to have been bifacially flaked suggesting that it is a knife. However, we do not have a side view for this object (only two images were provided by the finder) so we cannot be certain. It looks to have pressure flaking on dorsal side. It was probably formed on tertiary debitage rather than a deliberate stuck core.